I read from time to time that “we have not sampled Uralic speakers yet”, and “we are waiting to see when Uralic-speaking peoples are sampled”. Are we, though? Proto-language homelands are based on linguistic data, such as guesstimates for dialectal evolution, loanwords and phonetic changes for language contacts, toponymy for ancient territories, etc. depending on the available information. The trace is then followed back, using available archaeological data, from the known historic speakers and territory to the appropriate potential prehistoric cultures. Only then can genetic analyses help us clarify the precise prehistoric population movements that better fit the models. We thought – using linguistic guesstimates and fitting prehistoric cultures and their expansion – that Yamna was the Late Proto-Indo-European culture, so when Yamna was sampled, we had Late Proto-Indo-Europeans sampled. Simple deduction. For those supporting a western continuity (and assuming CWC was Indo-European), the language was present at least since the Comb Ware culture, potentially since the Mesolithic. For those supporting a late introduction into Finland, Uralic expanded the latest with Abashevo-related movements after its incorporation of Volosovo and related hunter-gatherers. The expansion to the east must have happened through progressive infiltrations with Seima-Turbino / Andronovo-related expansions. Some datings for the traditional proto-stages from Uralic to Finnic. Kallio (2014). The Volga-Kama Basin lies still too far east to be included in a list of possible contact locations. Instead, we could look for the contact area somewhere between Estonia in the west and the surroundings of Moscow in the east, a zone with evidence of Uralic settlement in the north and Baltic on the south side. The only linguistically well-grounded version of the Stone Age continuation theory was presented by Mikko Korhonen in 1976. Its validity, however, became heavily threatened when Koivulehto 1983a-b proved the existence of a Late Proto-Indo-European or Pre-Baltic loanword layer in Saami, Finnic, and Mordvinic. Since this layer must precede the Baltic one and it was presumably acquired in the Baltic Sea region, Koivulehto posited it on the horizon of the Battle Axe period. This forces a later dating for the Baltic–Finnic contacts. Today the Battle Axe culture is dated at 3200 to 3000 BC, a period far too remote to correspond linguistically with Proto-Baltic (Kallio 1998a). Since the Baltic contacts began at a very initial phase of Proto-Finnic, the language must have been relatively uniform at that time. Hence, if we consider that the layer of Baltic loanwords may have spread over the Gulf of Finland at that time, we could also insist that the whole of the Proto-Finnic language did so. Prehistoric Balts as the southern neighbours of Proto-Finnic speakers. 1 = The approximated area of Proto-Uralic. 2 = The approximated area of Finnic during the Iron Age. 3 = The area of ancient Baltic hydronyms. 4 = The area of Baltic languages in about 1200 AD. 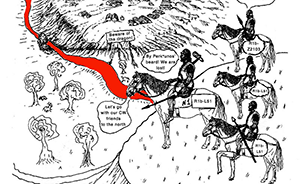 5 = The problem: When did Uralic expand westwards and when did it meet Baltic? Junntila (2012). (…) the loanword evidence furthermore suggests that the ancestors of Finnic and Saamic had at least phonologically remained very close to Proto-Uralic as late as the Bronze Age (ca. 1700–500 BC). 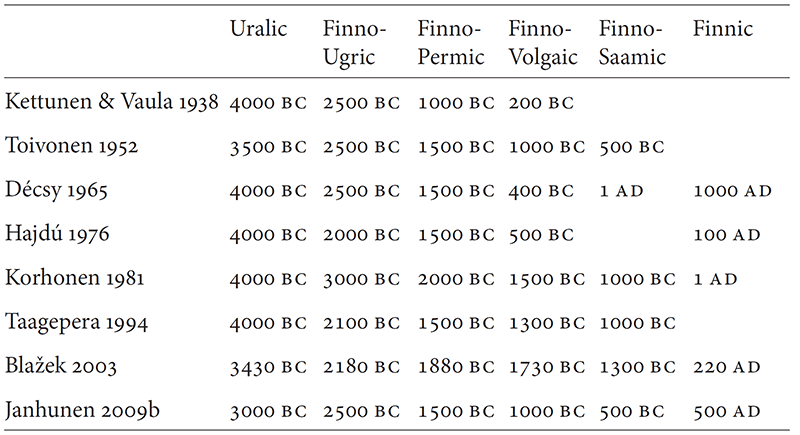 In particular, certain loanwords, whose Baltic and Germanic sources point to the first millennium BC, after all go back to the Finno-Saamic proto-stage, which is phonologically almost identical to the Uralic proto-stage (see especially the table in Sammallahti 1998: 198–202). This being the case, Dahl’s wave model could perhaps have some use in Uralic linguistics, too. The presence of Pre-Germanic loanwords points rather to the centuries around the turn of the 2nd – 1st millennium BC or earlier. Proto-Germanic words must have been borrowed before the end of Germanic influence in the eastern Baltic at the beginning of the Iron Age, which sets a clear terminus ante quem ca. 800 BC. The arrival of Bell Beaker peoples in Scandinavia ca. 2350 BC, heralding the formation of the Dagger Period, as well as the development of Pre-Germanic in common with Finnic-like populations point to the late 3rd / early 2nd millennium BC as the first time of close interaction through the Baltic region. (…) the earliest Indo-European loanwords in the Uralic languages (…) show that Proto-Uralic cannot have been spoken much earlier than Proto-Indo-European dated about 3500 BC (Koivulehto 2001: 235, 257). As the same loanword evidence naturally also shows that the Uralic and Indo-European homelands were not located far from one another, the Uralic homeland can most likely be located in the Middle and Upper Volga region, right north of the Indo-European homeland*. From the beginning of the Subneolithic period about 5900 BC onwards, this region was an important innovation centre, from where several cultural waves spread to the Finnish Gulf area, such as the Sperrings Ware wave about 4900 BC, the Combed Ware wave about 3900 BC, and the Netted Ware wave about 1900 BC (Carpelan & Parpola 2001: 78–90). The mainstream position is nowadays trying to hold together the traditional views of Corded Ware as Indo-European, and a Uralic Fennoscandia during the Bronze Age. 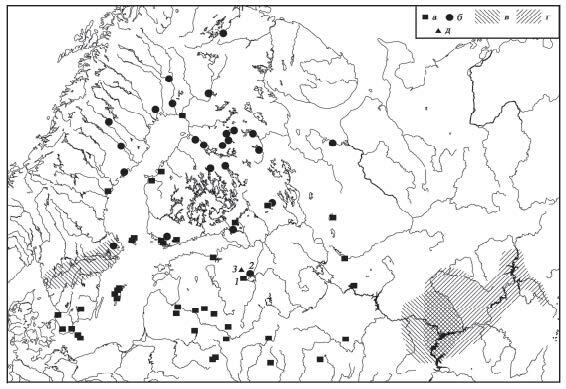 The extent of Typical Comb Ware (TCW), Asbestos- and Organic-tempered Wares (AOW) and Volosovo and Garino-Bor cultures; areas with deposits of native copper in Karelia and copperbearing sandstone in Volga-Kama-area are marked dark gray (after Zhuravlev 1977; Krajnov 1987; Nagovitsyn 1987; Chernykh 1992; Carpelan 1999; Zhul´nikov 1999). From Nordqvist et al. (2012). 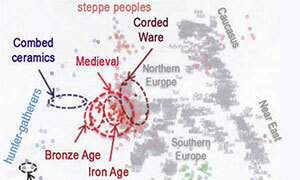 The Corded Ware (or Battle Axe) culture intruded into the Eastern Baltic and coastal Finland already around 3100 BCE. The continuity hypothesis maintains that the early Proto-Finnic speakers of the coastal regions, who had come to Finland in the 4th millennium BCE with the Comb-Pitted Ware, coexisted with the Corded Ware newcomers, gradually adopting their pastoral culture and with it a number of NW-IE loanwords, but assimilating the immigrants linguistically. The fusion of the Corded Ware and the local Comb-Pitted Ware culture resulted into the formation of the Kiukais culture (c. 2300–1500) of southwestern Finland, which around 2300 received some cultural impulses from Estonia, manifested in the appearance of the Western Textile Ceramic (which is different from the more easterly Textile Ceramic or Netted Ware, and which is first attested in Estonia c. 2700 BCE, cf. Kriiska & Tvauri 2007: 88), and supposed to have been accompanied by an influx of loanwords coming from Proto-Baltic. At the same time, the Kiukais culture is supposed to have spread the custom of burying chiefs in stone cairns to Estonia. The coming of the Corded Ware people and their assimilation created a cultural and supposedly also a linguistic split in Finland, which the continuity hypothesis has interpreted to mean dividing Proto-Saami-Finnic unity into its two branches. 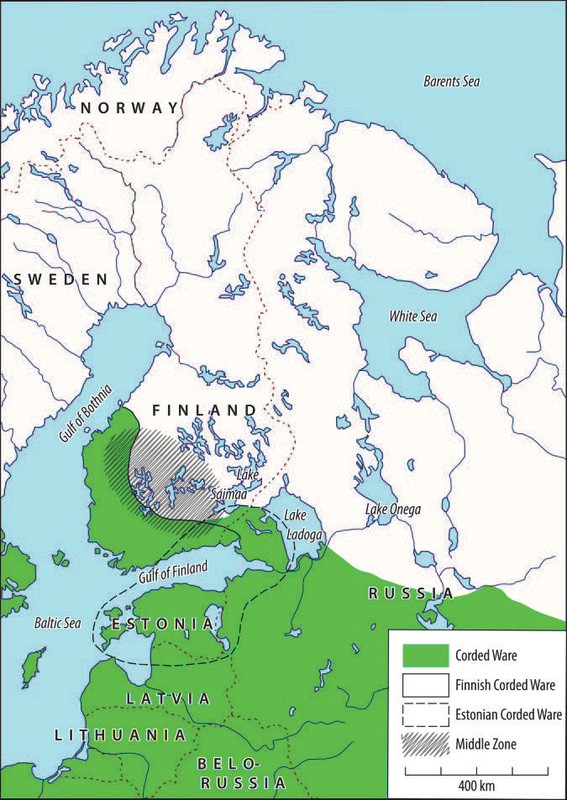 Baltic Finnic, or simply Finnic, would have emerged in the coastal regions of Finland and in the northern East Baltic, while preforms of Saami would have been spoken in the inland parts of Finland. The Nordic Bronze Age culture, correlated above with early Proto-Germanic, exerted a strong influence upon coastal Finland and Estonia 1600–700 BCE. Due to this, the Kiukais culture was transformed into the culture of Paimio ceramics (c. 1600–700 BCE), later continued by Morby ceramics (c. 700 BCE – 200 CE). The assumption is that clear cultural continuity was accompanied by linguistic continuity. Having assimilated the language of the Germanic traders and relatively few settlers of the Bronze Age, the language of coastal Finland is assumed to have reached the stage of Proto-Finnish at the beginning of the Christian era. In Estonia, the Paimio ceramics have a close counterpart in the contemporaneous Asva ceramics. I will not comment on Siberian or Central Asian homeland proposals, because they are obviously not mainstream, still less today when we know that Uralic was certainly in contact with Proto-Indo-European, and then with Pre- and Proto-Indo-Iranian, as supported even by the Copenhagen group in Damgaard et al. (2018). Interestingly, the only Uralicists who generally reject the Central Russian homeland are the Russian ones who prefer the Siberian homeland instead. Some Russians even advocate that the Central Russian homeland is only due to Finnish nationalism or, as one of them put it a bit more tactfully, “the political and ideological situation in Finland in the first decades of the 20th century” (Napolskikh 1995: 4). Still, some Finns (and especially those who also belong to the “school who wants it large and wants it early”) simultaneously advocate that exactly the same Central Russian homeland is due to Finnlandisierung (Wiik 2001: 466). These fringe Finnish theories look a lot like the Corded Ware expansion… Better not go the Russian or Finnish nationalist ways? Agreed then, let’s discuss only rational proposals based on current data. For a detailed account of the Corded Ware expansion with Battle Axe, Fatyanovo-Balanovo, and Abashevo groups into the area, you can read my recent post on the origin of R1a-Z645. During the 2nd millennium BC, textile impressions appear in pottery as a feature across a wide region, from the Baltic area through the Volga to the Urals, in communities that evolve from late Corded Ware groups without much external influence. While it has been held that this style represents a north-west expansion from the Volga region (with the “Netted Ware” expansion), there are actually at least two original textile styles, one (earlier) in the Gulf of Finland, common in the Kiukainen pottery, which evolves into the Textile ware culture proper, and another which seems to have an origin in the Middle Volga region to the south-east. The Netted ware culture is the one that apparently expands into inner Finland – a region not densely occupied by Corded Ware groups until then. There are, however, no clear boundaries between groups of both styles; textile impressions can be easily copied without much interaction or population movement; and the oldest textile ornamentation appeared on the Gulf of Finland. Hence the tradition of naming all as groups of Textile ceramics. 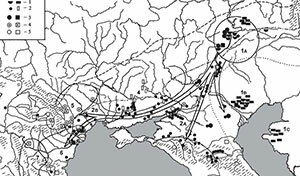 Maximum distribution of Textile ceramics during the Bronze Age (ca. 2000-800 BC). 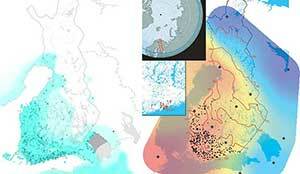 Asbestos-tempered ware lies to the north (and is also continued in western Fennoscandia). no gross population movements in the original Battle Axe / Fatyanovo regions, except for the expansion of Netted Ware to inner Finland, Karelia, and the east, where the scattered Battle Axe finds and worsening climatic conditions suggest most CWC settlements disappeared at the end of the 3rd millennium BC and recovered only later. NOTE. This lack of population movement – or at least significant replacement by external, non-CWC groups – is confirmed in genetic investigation by continuity of CWC-related lineages (see below). The technology present in Textile ceramics is in clear contrast to local traditions of sub-Neolithic Lovozero and Pasvik cultures of asbestos-tempered pottery to the north and east, which point to a different tradition of knowledge and learning network – showing partial continuity with previous asbestos ware, since these territories host the main sources of asbestos. 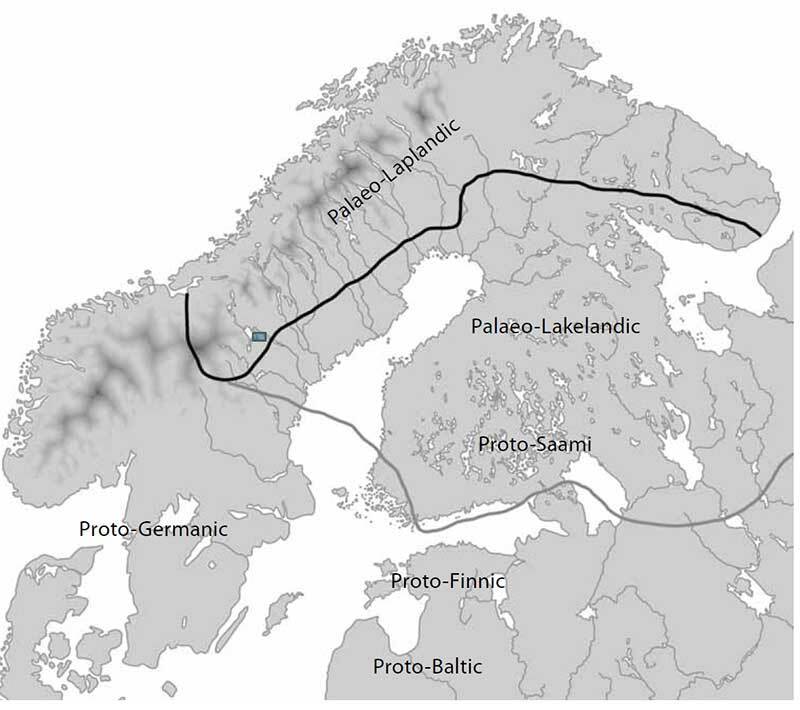 We have to assume that these cultures of northern and eastern Fennoscandia represent Palaeo-European (eventually also Palaeo-Siberian) groups clearly differentiated from the south. The Chirkovo culture (ca. 1800-700 BC) forms on the middle Volga – at roughly the same time as Netted Ware formed to the west – from the fusion of Abashevo and Balanovo elites on Volosovo territory, and is also related (like Abashevo) to materials of the Seima-Turbino phenomenon. In the Gulf of Finland, Kiukainen evolves into the Paimio ceramics (in Finland) — Asva Ware (in Estonia) culture, which lasts from ca. 1600 to ca. 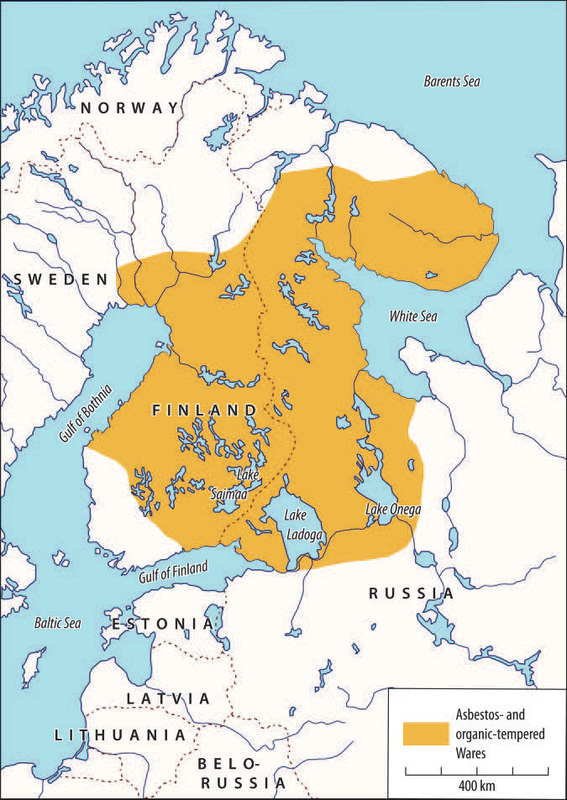 700 BC, probably representing an evolving Finno-Saamic community, while the Netted Ware from inner Finland (the Sarsa and Tomitsa groups) and the groups from the Forest Zone possibly represent a Volga-Finnic community. NOTE. Nevertheless, the boundaries between Textile ceramic groups are far from clear, and inner Finland Netted Ware groups seem to follow a history different from Netted Ware groups from the Middle and Upper Volga, hence they could possibly be identified as an evolving Pre-Saamic community. The whole Finno-Permic community remains thus in close contact, allowing for the complicated picture that Kallio mentions as potentially showing Dahl’s wave model for Uralic languages. 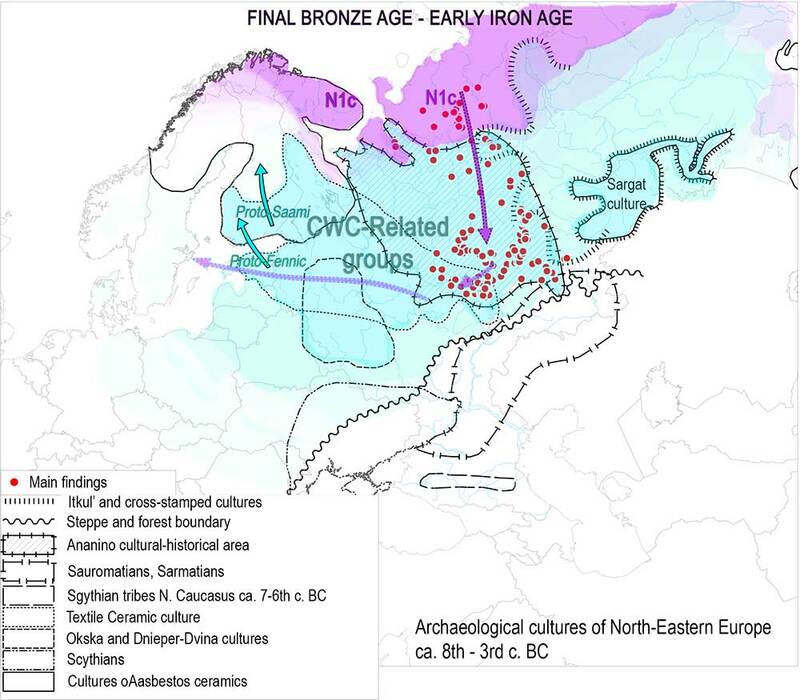 [Of the 24 Bronze Age samples from stone-cist graves] all 18 Bronze Age males belong to R1a. The Saami substrate in the Finnish dialects thus reveals that also Lakeland Saami languages had a large number of vocabulary items of obscure origin. Most likely many of these words were substrate in Lakeland Saami, too, and ultimately derive from languages spoken in the region before Saami. In some cases the loan origin of these words is obvious due to their secondary Proto-Saami vowel combinations such as *ā–ë in *kāvë ‘bend; small bay’ and *šāpšë ‘whitefish’. This substrate can be called ‘Palaeo-Lakelandic’, in contrast to the ‘Palaeo-Laplandic’ substrate that is prominent in the lexicon of Lapland Saami. As the Lakeland Saami languages became extinct and only fragments of their lexicon can be reconstructed via elements preserved in Finnish place-names and dialectal vocabulary, we are not in a position to actually study the features of this Palaeo-Lakelandic substrate. Its existence, however, appears evident from the material above. A) The central Finnish group, in this hypothesis the Palaeo-Lakelandic group, made up of the descendants of the Mesolithic pioneers of the Komsa and Suomusjärvi cultures, and thus mainly Baltic HG / Scandinavian HG ancestry and haplogroups I / R1b(xM269) (see more on Scandinavian HG). Frequency map of the so-called ‘Siberian’ component. From Tambets et al. (2018). 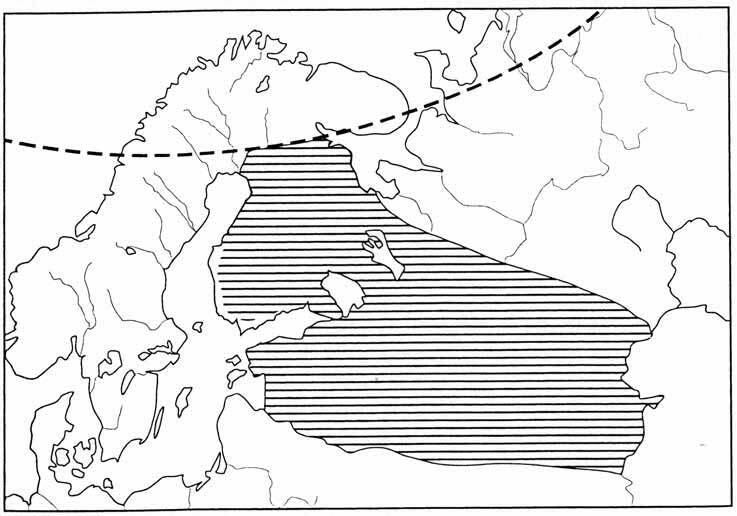 B) Lapland and Kola were probably also inhabited by similar Mesolithic populations, until it was eventually assimilated by expanding Siberian groups (of Siberian ancestry and N1c-L392 lineages) from the east – entering the region likely through the Kola peninsula – , forming the Palaeo-Laplandic group, which was in turn later replaced by expanding Proto-Saamic groups. 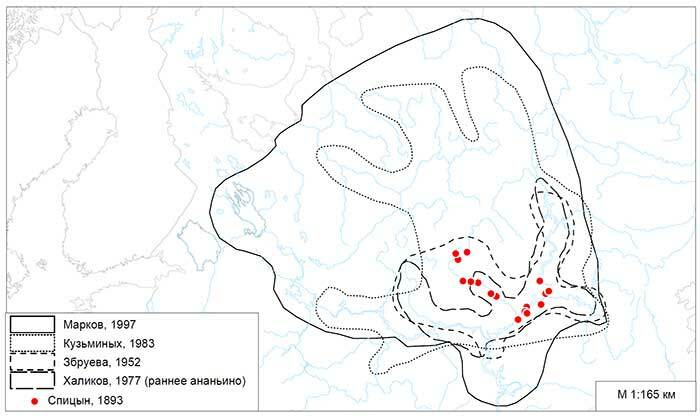 The large Siberian component in the Bolshoy individuals from the Kola Peninsula provides the earliest direct genetic evidence for an eastern migration into this region. Such contact is well documented in archaeology, with the introduction of asbestos-mixed Lovozero ceramics during the second millenium BC, and the spread of even-based arrowheads in Lapland from 1,900 BCE. Additionally, the nearest counterparts of Vardøy ceramics, appearing in the area around 1,600-1,300 BCE, can be found on the Taymyr peninsula, much further to the east. Finally, the Imiyakhtakhskaya culture from Yakutia spread to the Kola Peninsula during the same period. The fact that the Siberian genetic component is consistently shared among Uralic-speaking populations, with the exceptions of Hungarians and the non-Uralic speaking Russians, would make it tempting to equate this component with the spread of Uralic languages in the area. However, such a model may be overly simplistic. First, the presence of the Siberian component on the Kola Peninsula at ca. 4000 yBP predates most linguistic estimates of the spread of Uralic languages to the area. 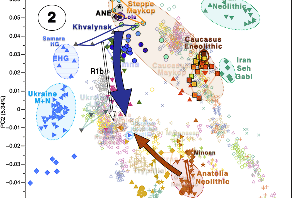 Second, as shown in our analyses, the admixture patterns found in historic and modern Uralic speakers are complex and in fact inconsistent with a single admixture event. 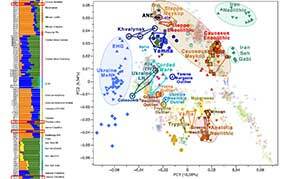 Therefore, even if the Siberian genetic component partly spread alongside Uralic languages, it likely presented only an addition to populations carrying this component from earlier. The Ananino culture appears in the Vyatka-Kama area, famed for its metallurgy, with traditions similar to the North Pontic area, by this time developing Pre-Sauromatian traditions. It expanded to the north in the first half of the first millennium BC, remaining in contact with the steppes, as shown by the ‘Scythian’ nature of its material culture. NOTE. The Ananino culture can be later followed through its zoomorphic styles into Iron Age Pjanoborskoi and Gljadenovskoi cultures, later to Ural-Siberian Middle Age cultures – Itkuska, Ust’-Poluiska, Kulaiska cultures –, which in turn can be related as prototypes of medieval Permian styles. Territory of (early and maximum) Ananino material culture. Vasilyev (2002). At the same time as the Ananino culture begins to expand ca. 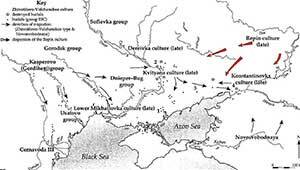 1000 BC, the Netted Ware tradition from the middle Oka expanded eastwards into the Oka-Vyatka interfluve of the middle Volga region, until then occupied by the Chirkovo culture. Eventually the Akozino or Akhmylovo group (ca. 800-300 BC) emerged from the area, showing a strong cultural influence from the Ananino culture, by that time already expanding into the Cis-Urals region. 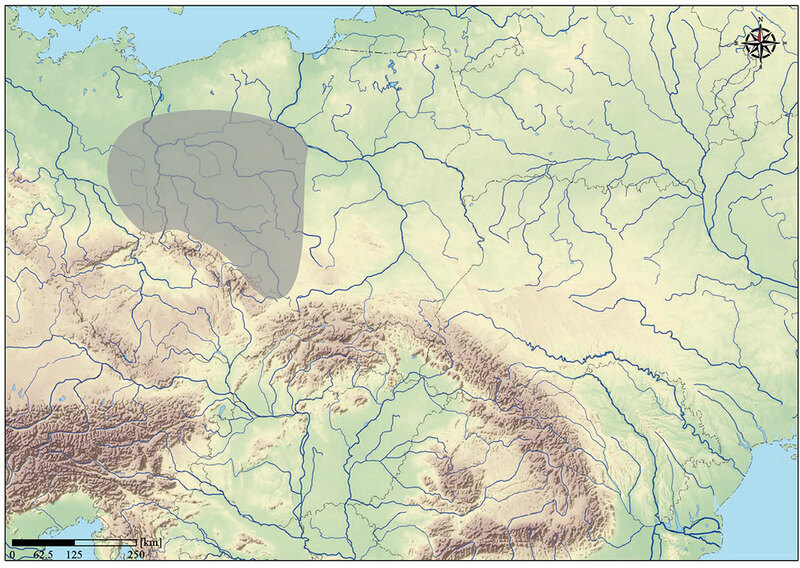 The Akozino culture remains nevertheless linked to the western Forest Zone traditions, with long-ranging influences from as far as the Lusatian culture in Poland (in metallurgical techniques), which at this point is also closely related with cultures from Scandinavia (read more on genetics of the Tollense Valley). Different materials from Akozino reach Fennoscandia late, at the end of the Bronze Age and beginning of the Early Iron Age, precisely when the influence of the Nordic Bronze Age culture on the Gulf of Finland was declining. This is a period when Textile ceramic cultures in north-eastern Europe evolve into well-armed chiefdom-based groups, with each chiefdom including thousands or tens of thousands, with the main settlements being hill forts, and those in Fennoscandia starting ca. 1000-400 BC. Mälar-type celts and Ananino-type celts appear simultaneously in Fennoscandia and the Forest Zone, with higher concentrations in south-eastern Sweden (Mälaren) and the Volga-Kama region, supporting the existence of a revived international trade network. Distribution of the Akozino-Mälar axes according to Sergej V. Kuz’minykh (1996: 8, Abb. 2). Akozino-Mälar axes (ca. 800-500 BC): introduced into the Baltic area in so great numbers – especially south-western Finland, the Åland islands, and the Mälaren area of eastern Sweden – that it is believed to be accompanied by a movement of warrior-traders of the Akozino-Akhmylovo culture, following the waterways that Vikings used more than a thousand years later. 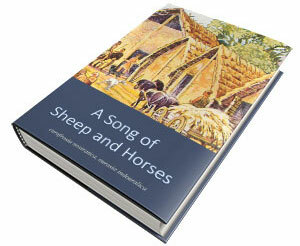 Rather than imports, they represent a copy made with local iron sources. Tarand graves (ca. 500 BC – AD 400): these ‘mortuary houses’ appear in the coastal areas of northern and western Estonia and the islands, at the same time as similar graves in south-western Finland, eastern Sweden, northern Latvia and Courland. 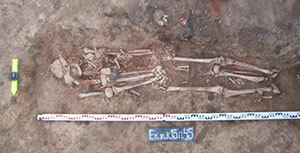 Similar burials are found in Akozino-Akhmylovo, with grave goods also from the upper and middle Volga region, while grave goods show continuity with Textile ware. The use of asbestos increases in mainland Finnish wares with Kjelmøy Ware (ca. 700 BC – AD 300), which replaced the Lovozero Ware; and in the east in inner Finland and Karelia with the Luukonsaari and Sirnihta wares (ca. 700-500 BC – AD 200), where they replaced the previous Sarsa-Tomitsa ceramics. The Gorodets culture appears during the Scythian period in the forest-steppe zone north and west of the Volga, shows fortified settlements, and there are documented incursions of Gorodets iron makers into the Samara valley, evidenced by deposits of their typical pottery and a bloom or iron in the region. 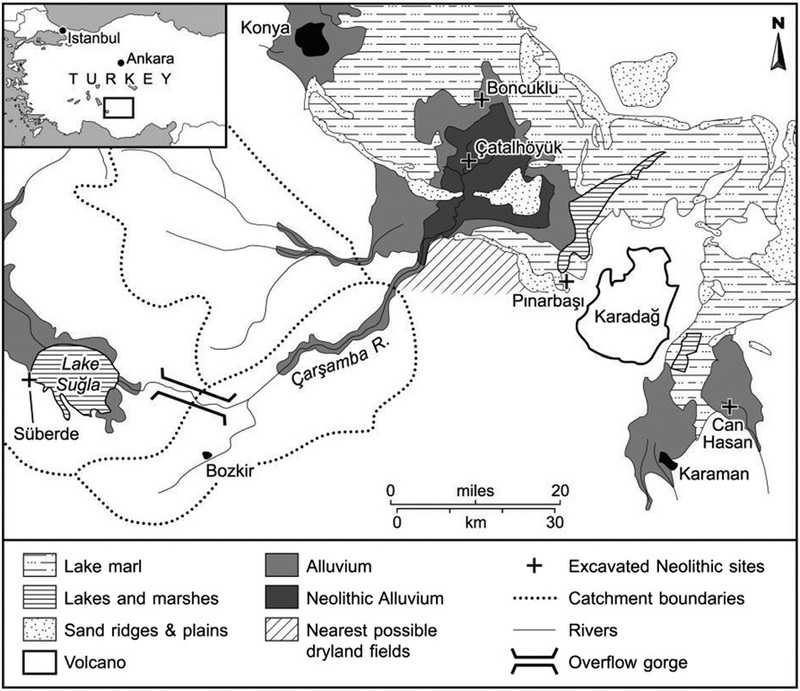 It is commonly accepted by archaeology, ethnography, and linguistics that the ancestors of the Permian peoples (the Udmurts, Komi-Permians, and Komi-Zyryans) left the sites of Ananyino cultural intercommunity. NOTE. 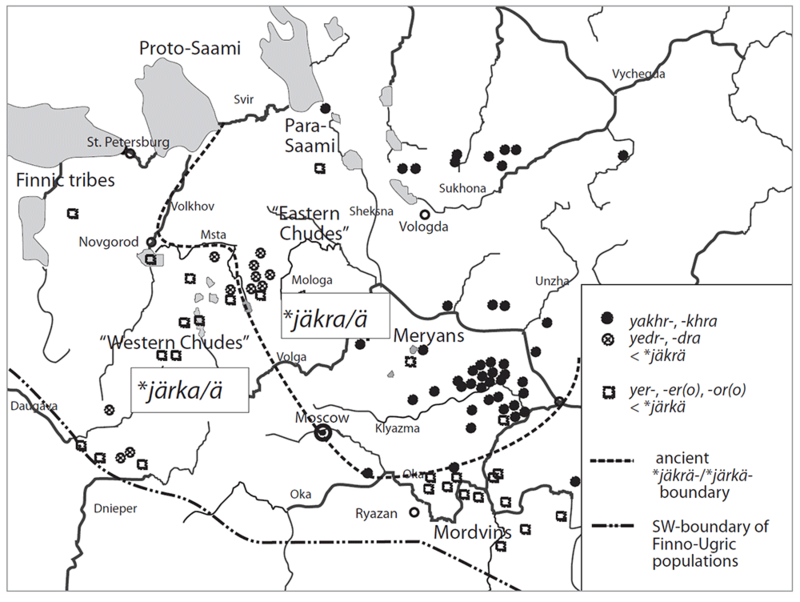 For more information on the Late Metal Ages and Early Medieval situation of Finno-Ugric languages, see e.g. 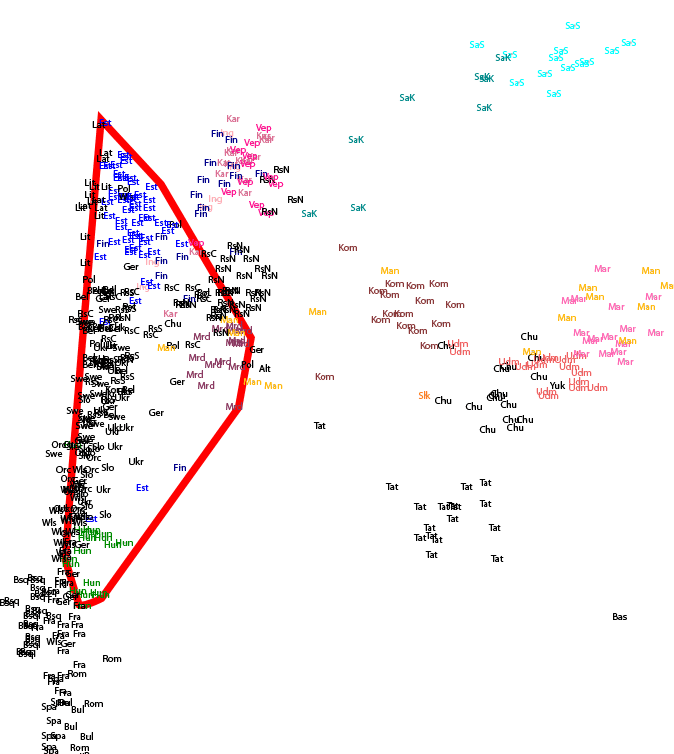 South-eastern contact area of Finnic languages in the light of onomastics (Rahkonen 2013). the geminate *mm (foreign to Proto-Uralic before the development of Fennic under Germanic influence) and other non-Uralic consonant clusters. the change of numeral *luka ‘ten’ with *kümmen. The presence of loanwords of non-Uralic origin, related to farming and trees, potentially Palaeo-European in nature (hence possibly from Siberian influence in north-eastern Europe). Map of archaeological cultures in north-eastern Europe ca. 8th-3rd centuries BC. [The Mid-Volga Akozino group not depicted] Shaded area represents the Ananino cultural-historical society. Purple area show likely zones of predominant Siberian ancestry and N1c-L392 lineages. Blue areas likely zones of predominant CWC ancestry and R1a-Z645 lineages. 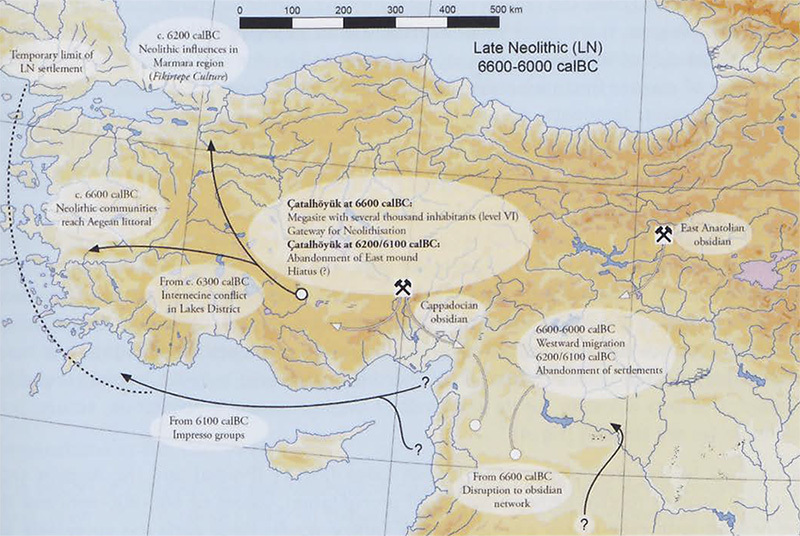 Fading purple arrows represent likely stepped movements of haplogroup N1c-L392 for centuries (Siberian → Ananino → Akozino → Fennoscandia), found eventually in tarand graves. Blue arrows represent eventual expansions of Fennic and (partially displaced) Saamic. Modified image from Vasilyev (2002). The introduction of a strongly hierarchical chiefdom system can quickly change the pre-existing social order and lead to a major genetic shift within generations, without a radical change in languages, as shown in Sintashta-Potapovka compared to the preceding Poltavka society (read more about Sintashta). Fortified settlements in the region represented in part visiting warrior-traders settled through matrimonial relationships with local chiefs, eager to get access to coveted goods and become members of a distribution network that could guarantee them even military assistance. Such a system is also seen synchronously in other cultures of the region, like the Nordic Bronze Age and Lusatian cultures (Parpola 2013). The most likely situation is that N1c subclades were incorporated from the Circum-Artic region during the Anonino (Permic) expansion to the north, later emerged during the formation of the Akozino group (Volgaic, under Anonino influence), and these subclades in turn infiltrated among the warrior traders that spread all over Fennoscandia and the eastern Baltic (mainly among Fennic, Saamic, Germanic, and Balto-Slavic peoples), during the age of hill forts, creating alliances partially based on exogamy strategies (Parpola 2013). first on the Middle Volga, when Ananino expands to the north, incorporatinig N1c lineages from the Circum-Artic region. and later with the different population movements that led eventually to a greater or lesser relevance of N1c in modern Finno-Permic populations. To argue that this infiltration and later expansion of lineages changed the language in one culture in one of these events seems unlikely. To use this argument of “opposite movement of ethnic and language change” for different successive events, and only on selected regions and cultures (and not those where the greatest genetic and cultural impact is seen, like e.g. Sweden for Akozino materials) is illogical. NOTE. Notice how I write here about “infiltration” and “lineages”, not “migration” or “populations”. 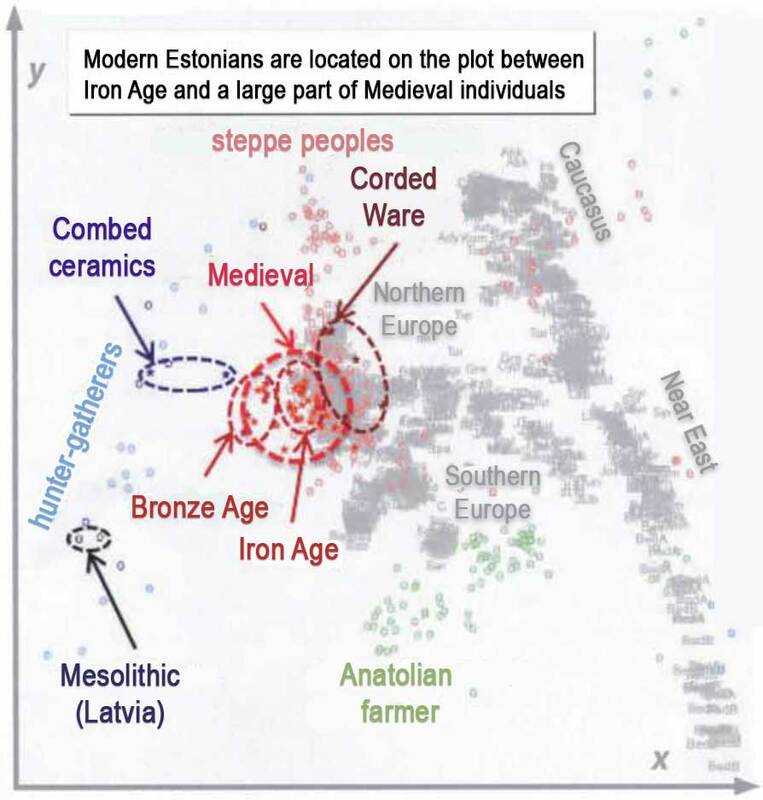 To understand that, see below the next section on autosomal studies to compare Bronze Age, Iron Age, Medieval and Modern Estonians, and see how little the population of Estonia (homeland of Proto-Fennic and partially of Proto-Finno-Saamic) has changed since the Corded Ware migrations, suggesting genetic continuity and thus mostly close inter-regional and intra-regional contacts in the Forest Zone, hence a very limited impact of the absorbed N1c lineages (originally at some point incorporated from the Circum-Artic region). You can also check on the most recent assessment of R1a vs. N1c in modern Uralic populations. [Of the 13 samples from the Iron Age tarand-graves] We found that the Iron Age individuals do in fact carry chrY hg N3 (…) Furthermore, based on their autosomal data, all of the studied individuals appear closer to hunter-gatherers and modern Estonians than Estonian CWC individuals do. EDIT (16 OCT) A recent abstract with Saag as main author (Tambets second) cites 3 out of 5 sampled Iron Age individuals as having haplogroup N3. EDIT (28 OCT): Notice also the appearance of N1a1a1a1a1a1a1-L1025 in Lithuania (ca. 300 AD), from Damgaard (Nature 2018); the N1c sample of the Krivichi Pskov Long Barrows culture (ca. 8th-10th c. AD), and N1a1a1a1a1a1a7-Y4341 among late Vikings from Sigtuna (ca. 10th-12th c. AD) in Krzewinska (2018). 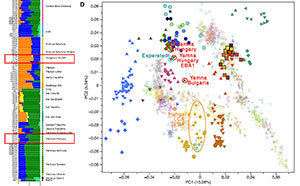 Looking at the plot, the genetic inflow marking the change from the Bronze Age to the Iron Age looks like an obvious expansion of nearby peoples with CWC-related ancestry, i.e. likely from the south-east, near the Middle Volga, where influence of steppe peoples is greater (hence likely Akozino) into a Proto-Fennic population already admixed (since the arrival of Corded Ware groups) with Comb Ware-like populations. All of these groups were probably R1a-Z645 (likely R1a-Z283) since the expansion of Corded Ware peoples, with an introduction of some N1c lineages precisely during this Iron Age period. This infiltration of N1c-L392 with Akozino is obviously not directly related to Siberian cultures, given what we know about the autosomal description of Estonian samples. This genetic continuity from Corded Ware (the most likely Proto-Uralic homeland) to the Proto-Fennic and Proto-Saamic communities in the Gulf of Finland correlates very well with the known conservatism of Finno-Saamic phonology, quite similar to Finno-Ugric, and both to Proto-Uralic (Kallio 2017): The most isolated region after the expansion of Corded Ware peoples, the Gulf of Finland, shielded against migrations for almost 1,500 years, is then the most conservative – until the arrival of Akozino influence. NOTE. This has its parallel in the phonetic conservatism of Celtic or Italic compared to Finno-Ugric-influenced Germanic, Balto-Slavic, or Indo-Iranian. The Finnic family tree. Kallio (2014). The initial Proto-Fennic expansion was probably coupled with the expansion of Proto-Saami to the north, with the Kjelmøy Ware absorbing the Siberian population of Lovozero Ware, and potentially in inner Finland and Karelia with the Luukonsaari and Sirnihta wares (Carpelan and Parpola 2017). 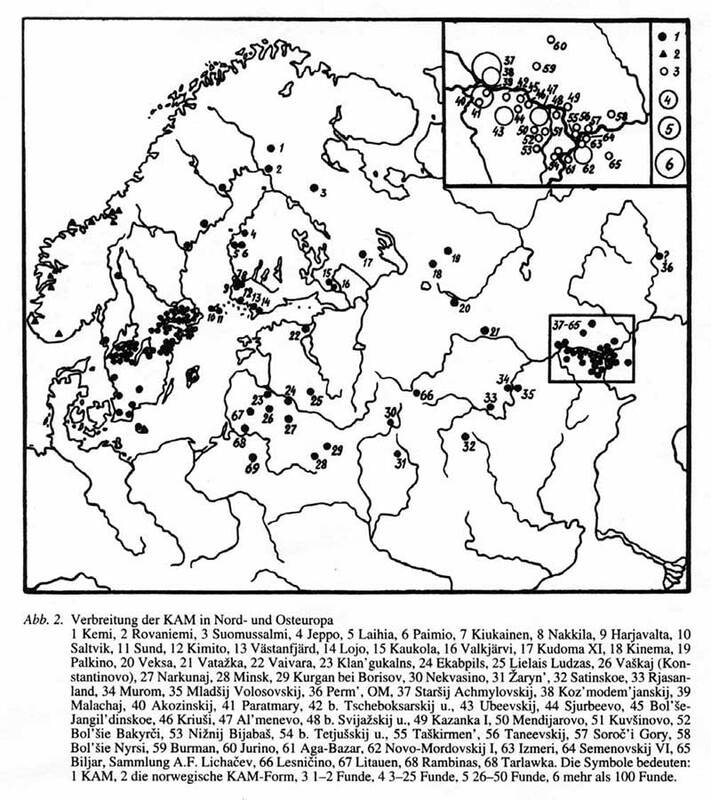 This Proto-Saami population expansion from the mainland to the north, admixing with Lovozero-related peoples, is clearly reflected in the late Iron Age Saamic samples from Levänluhta (ca. 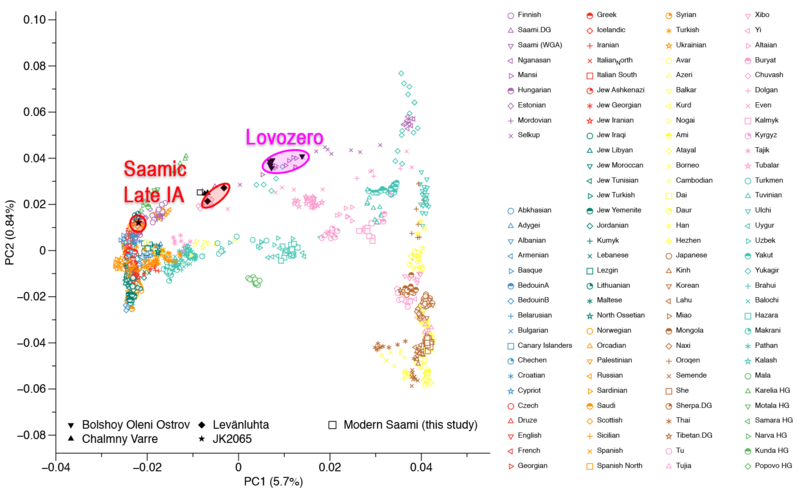 400-800 AD), as a shift (of 2 out of 3 samples) to Siberian-like ancestry from their original CWC_Baltic-like situation (see PCA from Lamnidis et al. 2018 above). Also, Volgaic and Permic populations from inner Finland and the Forest Zone to the Cis-Urals and Circum-Artic regions probably incorporate Siberian ancestry and N1c-L392 lineages during these and later population movements, while the westernmost populations – Estonian, Mordvinic – remain less admixed (see PCA from Tambets et al. 2018 below). 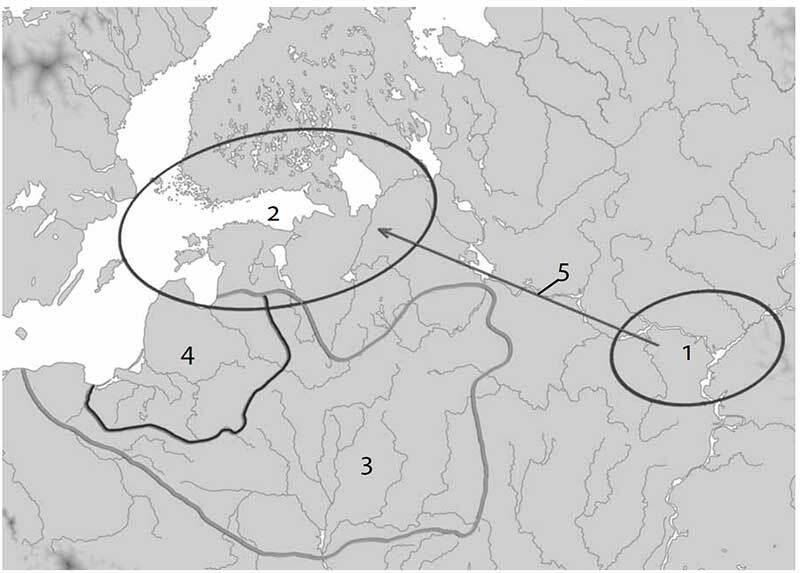 We also have data of N1c-L392 in Nordic territory in the Middle Ages, proving its likely strong presence in the Mälaren area since the Iron Age, with the arrival of Akozino warrior traders. Similarly, it is found among Balto-Slavic groups along the eastern Baltic area. Obviously, no language change is seen in Nordic Bronze Age and Lusatian territory, and none is expected in Estonian or Finnish territory, either. Therefore, no “N1c-L392 + Siberian ancestry” can be seen expanding Finno-Ugric dialects, but rather different infiltrations and population movements with limited effects on ancestry and Y-DNA composition, depending on the specific period and region. Selection of the PCA, with the group of Estonians, Mordovians, and Hungarians selected. See Tambets et al. (2018) for more information. Because N1c-L392 subclades & Siberian ancestry, which appear in different proportions and with different origins among some modern Uralic peoples, do not appear in cultures supposed to host Uralic-speaking populations until the Iron Age, people keep looking into any direction to find the ‘true’ homeland of those ‘Uralic N1c peoples’? Kind of a full circular reasoning, anyone? The same is valid for R1a & steppe ancestry being followed for ‘Indo-Europeans’, or R1b-P312 & Neolithic farmer ancestry being traced for ‘Basques’, because of their distribution in modern populations. I understand the caution of many pointing to the need to wait and see how samples after 2000 BC are like, in every single period, from the middle and upper Volga, Kama, southern Finland, and the Forest Zone between Fennoscandia and the steppe. It’s like waiting to see how people from Western Yamna and the Carpathian Basin after 3000 BC look like, to fill in what is lacking between East Yamna and Bell Beakers, and then between them and every single Late PIE dialect. 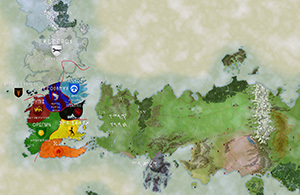 But the answer for Yamna-Bell Beaker-Poltavka peoples during the Late PIE expansion is always going to be “R1b-L23, but with R1a-Z645 nearby” (we already have a pretty good idea about that); and the answer for the Forest Zone and northern Cis- and Trans-Urals area – during the time when Uralic languages are known to have already been spoken there – is always going to be “R1a-Z645, but with haplogroup N nearby”, as is already clear from the data on the eastern Baltic region. So, without a previously proposed model as to where those amateurs expressing concern about ‘not having enough data’ expect to find those ‘Uralic peoples’, all this waiting for the right data looks more like a waiting for N1c and Siberian ancestry to pop up somewhere in the historic Uralic-speaking area, to be able to say “There! A Uralic-speaking male!”. Not a very reasonable framework to deal with prehistoric peoples and their languages, I should think. First N1c – Finno-Ugric person arrives in Estonia to teach Finno-Saamic to Balto-Slavic peoples. During the Bronze Age, late Corded Ware groups evolve as the western Textile ware Fennic Balto-Slavic group in the Gulf of Finland; the Netted Ware Saamic Balto-Slavic group of inner Finland; the south Netted Ware / Akozino Volgaic Balto-Slavic groups of the Middle Volga; and the Anonino Permic Balto-Slavic group in the north-eastern Forest Zone; all developing still in close contact with each other, allowing for common traits to permeate dialects. 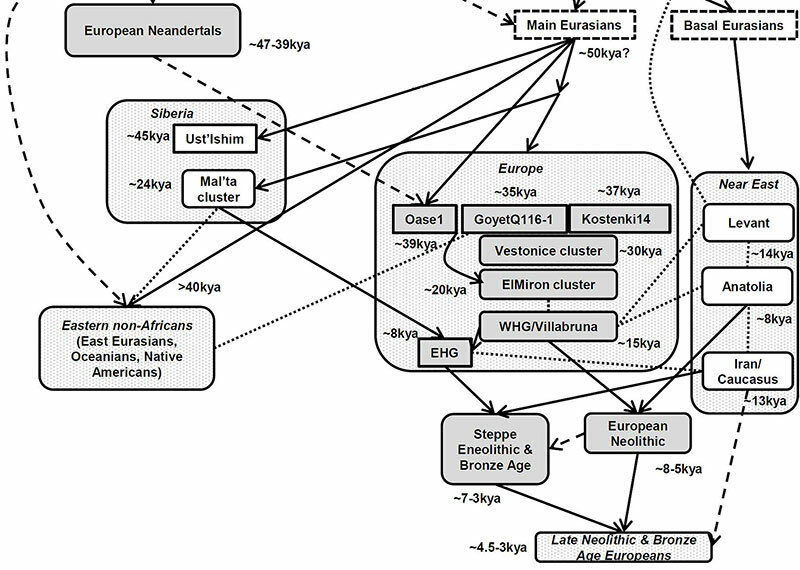 The current model for those obsessed with modern Y-DNA is, therefore, that expanding Neolithic, Bronze Age and Iron Age cultures from north-eastern Europe adopted the languages of certain lineages originally from sub-Neolithic (Scandinavian and Siberian) hunter-gatherer populations of the Circum-Artic region; lineages that these cultures incorporated unevenly during their expansions. Hmmmm… Sounds like an inverse Western movie, where expanding Americans end up speaking Apache, and the eastern coast speaks Spanish until Italian migrants arrive and make everyone speak English… or something. A logic, no-nonsense approach to ethnolinguistic identification. I kid you not, this is the kind of models we are going to see very soon. In 2018 and 2019, with ancient DNA able to confirm or reject archaeological hypotheses based on linguistic data, people will keep instead creating new pet theories to support preconceived ideas based on the Y-DNA prevalent among modern populations. That is, information available in the 2000s. 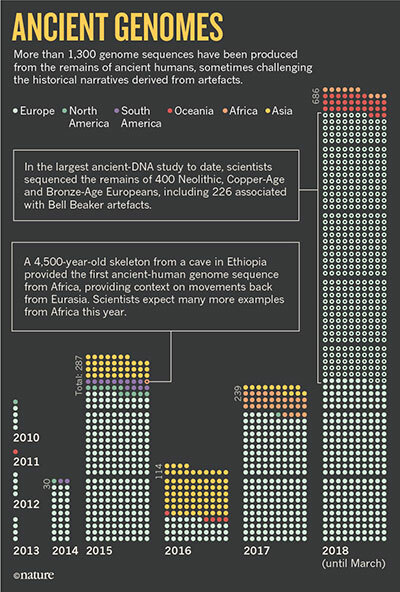 So what’s (so much published) ancient DNA useful for, exactly? Recent open access Symbols in motion: Flexible cultural boundaries and the fast spread of the Neolithic in the western Mediterranean, by Rigaud, Manen, García-Martínez de Lagrán, PLOS One (2018). The rapid diffusion of farming technologies in the western Mediterranean raises questions about the mechanisms that drove the development of intensive contact networks and circulation routes between incoming Neolithic communities. Using a statistical method to analyze a brand-new set of cultural and chronological data, we document the large-scale processes that led to variations between Mediterranean archaeological cultures, and micro-scale processes responsible for the transmission of cultural practices within farming communities. The analysis of two symbolic productions, pottery decorations and personal ornaments, shed light on the complex interactions developed by Early Neolithic farmers in the western Mediterranean area. Pottery decoration diversity correlates with local processes of circulation and exchange, resulting in the emergence and the persistence of stylistic and symbolic boundaries between groups, while personal ornaments reflect extensive networks and the high level of mobility of Early Neolithic farmers. The two symbolic productions express different degrees of cultural interaction that may have facilitated the successful and rapid expansion of early farming societies in the western Mediterranean. Mean Inverse Distance Weighting (IDW) interpolation of the first two axes of the Principal Coordinates Analysis (Figure D in S1 File). Diversity of the pottery attributes (A) and bead-type associations (B) express two different cultural geographies. Maps were made by S. R. using the software QGIS 2.6.1 and Etopo1 Digital Elevation Model . https://doi.org/10.1371/journal.pone.0196488.g002. 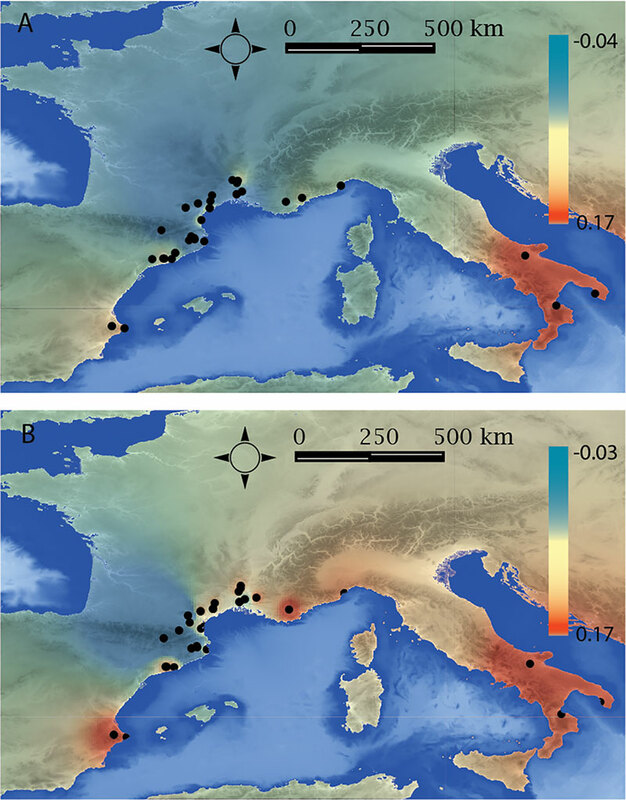 The maps of interpolated pottery decorative techniques and bead-type diversities throughout the western Mediterranean show the highest interpolated values in southern Italy (Fig B). Hotspots restricted to the east of the Rhône Valley in southern France and eastern Iberia are also visible on the map of bead-type association diversity. Conversely, southern France and eastern Iberia are characterized by lower interpolated values on the map of pottery decorative techniques diversity (Fig A). Our results shed light on the cultural mechanisms responsible for the complex cultural geography of the western Mediterranean during the transition to farming. Pottery decorations participated in restrained networks in which geographical proximity and local processes of transmission played an influential role. Bead-type associations were used to tell multiple stories about social identities, were especially resistant to change and are characterized by a greater stability through time and space. The high level of cultural connection between the early farming communities favored movement, interaction and exploration and likely represented a successful strategy for their rapid expansion in the western Mediterranean. Cultural boundaries persisted despite a flow of individuals and symbolic transfer across them. Genetic studies indicate that the last foragers and the first farmers developed social and cultural relationships more closely tied than previously indicated through components of the material culture . Biological data and chronological models support a pattern of diffusion implying geographically discontinuous contacts between local foragers and incoming farmers, but repeated in time [9,140,141]. This process of diffusion conjointly occurred with changes in material culture, including pottery decorations and personal ornaments. Pottery production represents a technological innovation mostly associated with the Neolithic way of life in the western Mediterranean. Pottery decorations were likely particularly sensitive to interactions, leading to their high variability in time and space in order to reinforce group membership. Conversely, personal ornaments were less inclined to change in space and time. Their production by both local foragers and incoming farmers implies different cultural readjustments that led to a completely different pattern of variation in time and space. 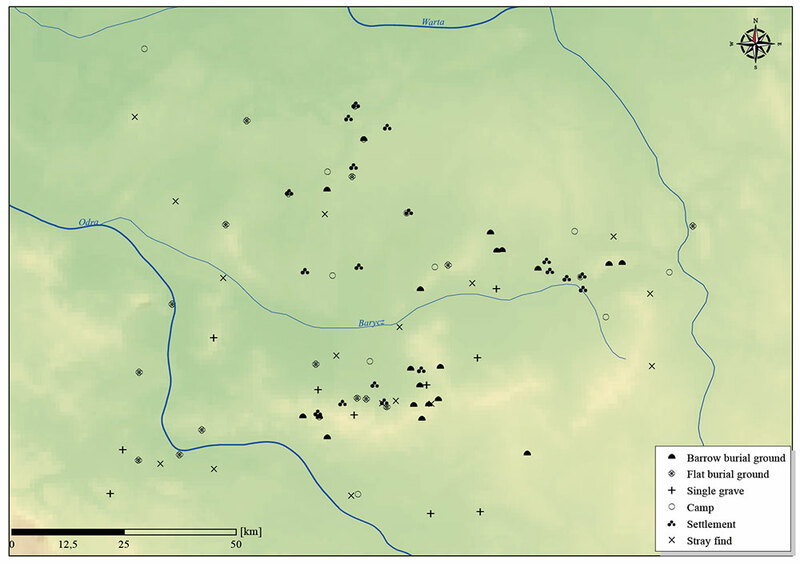 The preservation of the foragers’ personal ornament styles (and likely also meanings) within emerging farming communities [20,58] has probably contributed to the maintenance of their stability through time and space. The two symbolic productions appear as a polythetic set of cultural behaviors dedicated to mediating early farmer identities in many ways, and personal ornaments likely reflected the most entrenched and lasting facets of farmers’ ethnicity. This research is similar to the recent one by Kılınç et al. (2018) studying the same processes initially in Anatolia and the Aegean. With this one it may also be concluded that Archaeology is necessary to assess meaningful cultural (and thus potential ethnolinguistic) change, beyond gross genetic inflows, even in the case of the Near Eastern farmer expansion waves. Open access Population Size and the Rate of Language Evolution: A Test Across Indo-European, Austronesian, and Bantu Languages, by Greenhill et al. Front. Psychol (2018) 9:576. What role does speaker population size play in shaping rates of language evolution? There has been little consensus on the expected relationship between rates and patterns of language change and speaker population size, with some predicting faster rates of change in smaller populations, and others expecting greater change in larger populations. The growth of comparative databases has allowed population size effects to be investigated across a wide range of language groups, with mixed results. One recent study of a group of Polynesian languages revealed greater rates of word gain in larger populations and greater rates of word loss in smaller populations. However, that test was restricted to 20 closely related languages from small Oceanic islands. Here, we test if this pattern is a general feature of language evolution across a larger and more diverse sample of languages from both continental and island populations. We analyzed comparative language data for 153 pairs of closely-related sister languages from three of the world’s largest language families: Austronesian, Indo-European, and Niger-Congo. We find some evidence that rates of word loss are significantly greater in smaller languages for the Indo-European comparisons, but we find no significant patterns in the other two language families. These results suggest either that the influence of population size on rates and patterns of language evolution is not universal, or that it is sufficiently weak that it may be overwhelmed by other influences in some cases. Further investigation, for a greater number of language comparisons and a wider range of language features, may determine which of these explanations holds true. Our analysis suggests that, as for Polynesian languages, smaller Indo-European languages have greater rates of word loss from basic vocabulary. This result is consistent with the claim that smaller populations are at greater risk of loss of language elements, and other aspects of culture, due to effects of incomplete sampling of variants over generations. However, we note that the relatively small sample size for this dataset complicates the interpretation of this result. Least squares regression after Welch & Waxman test has the same false positive rate but has much less power than Poisson regression when sample size is small (~ten or fewer pairs, Hua et al., 2015). This makes it difficult to interpret the inconsistent results of these two analyses, as they may be due to their difference in the statistical power. Hence, the negative relationship between rates of loss and population size for Indo-European languages would benefit from additional investigation. We do not find evidence for a negative relationship between population size and word loss rates in the Austronesian and Bantu groups. This finding suggests that either these datasets contain too few language variants to have sufficient power to detect rate differences, or that the increased loss rate in small populations is not a universal phenomenon, or that it is a relatively weak force in some language groups and thus may be overwhelmed by other social, linguistic or demographic factors. [M]easuring speech community size is notoriously difficult. How exactly does one delimit a speech community (Crystal, 2008) and what degree of proficiency in a language is sufficient to be part of the community (Bloomfield, 1933)? This task is made harder as there are few national censuses that collect detailed speaker statistics. Further, speaker population size can change rapidly with many modern world languages (especially the Indo-European languages) experiencing rapid growth over the last few hundred years (Crystal, 2008), while others have experienced catastrophic declines (Bowern, 2010). For the same reasons, the difficulty of obtaining accurate population estimates is also a problem in biology. Furthermore, the relevant parameter for genetic change—the effective population size—is difficult to estimate directly, even when accurate census information is available (Wang et al., 2016). Likewise, there may be an important role played by population and network density—tight-knit networks may inhibit change, while loosely integrated speech communities (regardless of their size), may facilitate change (Granovetter, 1973; Milroy and Milroy, 1992). One way forward here is perhaps to simulate rates of change over a range of population sizes and network topologies (c.f. Reali et al., 2018). Firstly, we provide some evidence that rates of language change can be affected by demographic factors. Even if the effect is not universal, the finding of significant associations between population size and patterns of linguistic change in some languages urges caution for any analysis of language evolution that makes an assumption of uniform rates of change. These results also potentially provide a window on processes of language change in these lineages, providing further impetus to investigate the effect of number of speakers on patterns of language transmission and loss. A more detailed study of language change for a larger number of comparisons might clarify the relationship between population size and word loss rates, particularly within the Indo-European language family. Secondly, we have shown that the significant patterns of language change identified in a previous study are not a universal phenomenon. Unlike the study of Polynesian languages, we did not find any significant relationships between word gain rate and population size, and the association between loss rates and population size was not evident for all language families analyzed. The lack of universal relationships suggests that it may be difficult to draw general conclusions about the influence of demographic factors on patterns and rates of language change. Many other factors have been proposed to influence rates of language change (Greenhill, 2014) including population density, social structure (Nettle, 1999; Labov, 2007; Ke et al., 2008; Trudgill, 2011), degree of contact, and connectedness with other languages (Matras, 2009; Bowern, 2010), degree of language diffusion within a speech community (Wichmann et al., 2008), degree of bilingualism or multilingualism (Lupyan and Dale, 2010; Bentz and Winter, 2013), language group diversity (Atkinson et al., 2008) and environmental factors such as habitat heterogeneity and latitude (Bowern, 2010; Blust, 2013; Amano et al., 2014). These factors might mediate or overwhelm the effect of speaker population size. We find no evidence to support the hypothesis that uptake of new words should be faster in small populations, which is based on the assumption that new words can diffuse more efficiently through a smaller speaker population than a larger one (Nettle, 1999). Nor do we find support for the suggestion that large, widespread languages have a tendency to lose linguistic features a greater rate (Lupyan and Dale, 2010). However, this latter hypothesis is predominantly expected to explain loss of complex linguistic morphology (such as case systems), which may be harder for non-native speakers to learn, rather than basic vocabulary studied here which may be comparatively easier for second language learners to acquire (but see Kempe and Brooks, 2018). Further, our results cannot be interpreted as confirmation of previous studies that suggest there is no effect of population size on rates (Wichmann and Holman, 2009). 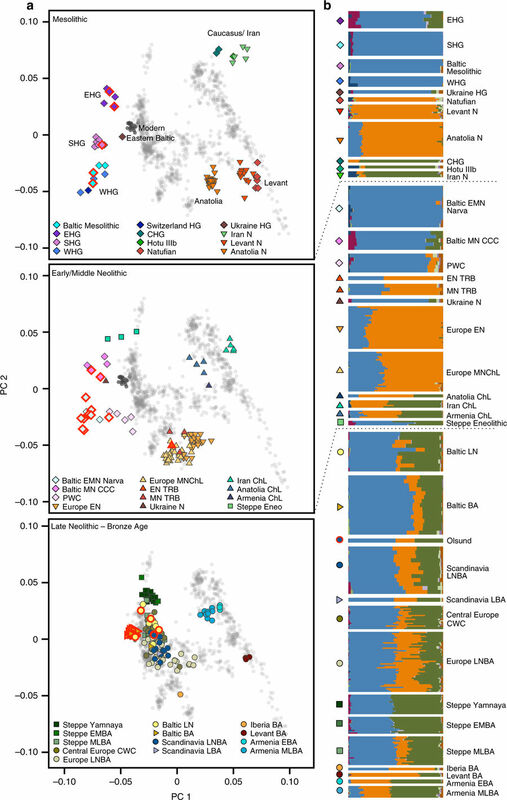 The detection of significant patterns in rates of lexical change with population size variation in the Polynesian and Indo-European languages, but the failure to identify similar patterns in the Bantu and Austronesian data, suggests that patterns of rates may need to be investigated on a case-by-case basis.